Truth serum... around this past Halloween we became slightly addicted to YouTube videos entitled American or Canadian or English boys &/or girls Try Japanese Candy. Along with the often hilarious reactions so many of the snacks they featured looked so good. So good and so different from treats we had access to. Wouldn't you know that a few days later the kind folks at skoshbox (edit: now Tokyo Otaku Mode), a Tokyo and LA based subscription box service, emailed about sending over authentic Japanese treats? Keep reading for a peek into the November skoshbox box plus two girls gleefully taste testing each piece: THE REVIEW > Joining me in the taste testing today is Magda, who thankfully, is currently studying Japanese. Peeling back the tissue paper you'll find colorful packages of all shapes and sizes, many of which are fully in Japanese. One nice aspect about the skoshbox team is they take the time to include a card letting you know what each item included is and full English translations of the ingredients labels. Magda: Hey old friend! Don't we eat these all the time? Marie: Yeah we do actually only the ones in the supermarkets here are often long and twisted like a pretzel, flavored with teriyaki and stale. These on the other hand are absolutely delicious. Magda: Thought so. These are very good, super fresh, nice and crunchy but not overly dry. Savory and slightly sweet at the same time. 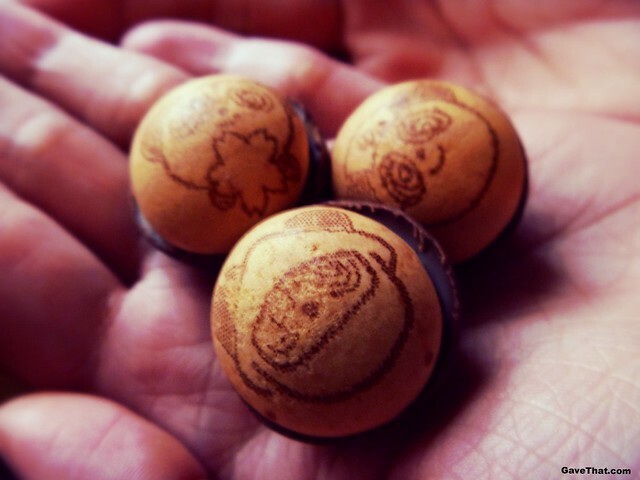 Magda: The little faces on these are so cute. The chocolate on these are nice and creamy, more on the fudge side and the crunch of the biscuit gives it character. Later she said these, overall these are my favorite out of everything I've tried so far and the best in this skoshbox. Then we pulled out the little bag of buttery milk flavored biscuit cookies called BISCUIT-SAURUS ビスケットサウルスthanks to the little Flintstones looking cave drawings stamped on each one. Magda: Not sure I'm getting the milk part of these but they are good. Light and simple little cookies that are crunchy and not too sweet. Marie: These look burnt. The flavor is a slightly scorched version of Nilla wafers. Insanely fresh and crisp. The last three treats from this skoshbox are these strawberry flavored ICHIGO MILK CANDY いちごみるくキャンディー : Magda: These are actually made with real strawberry juice and vitamin C. Marie: So these are actually kinda good for us? Magda: Who knows but you can taste the difference with these and the hard candy made here. The milk flavor really comes through in these and I like that they're not too sweet. Marie: I agree, the strawberry in these tastes incredibly realistic. No hint of that icky artificial flavoring aftertaste strawberry is known for. These are somewhere between those old fashioned hard strawberry candies with the goo inside and those strawberry and creme Lifesavers. Only these are more milk than cream which is interesting. Then there were the little Hello Kitty marshmallow puffs with creamy chocolate filling キティちゃんマシュマロ . How we like a good marshmallow around here: Magda: This looks like my mother's memory foam pillows [uncontrollable laughter followed]. Marie: It's sort of the shape of Hello Kitty's head but there is no face. You can feel the rod of chocolate inside of the marshmallow itself. Both are actually pretty dense and dry. I wouldn't say stale but different than the airy Jiffy Puffed marshmallows. Magda: The chocolate inside is more of a fudge chocolate frosting. What I'm noticing from tasting these is the chocolate seems different in Japan. Lastly in this box were two squares of chocolate. Sesame Mochi filled chocolates by GOMA-DANGO ごま団子チロルチョコ. Magda: I don't know, this was good but if you don't know what Mochi is you're in for a surprise. Picture a hard gummy bear covered in sesame paste and them dipped in white chocolate. I've never had anything like this before. Marie: When I fist smelled this my mind immediately went to the happy place of Halavah. Then I bit into it and it was delicious chocolate covered Halavah until I hit the center. That's when I hit the clear gel layer in the middle similar to gumdrops. Evidently this is the Mochi which is a sticky rice paste, in this case covered in whole sesame seeds and covered in white chocolate. 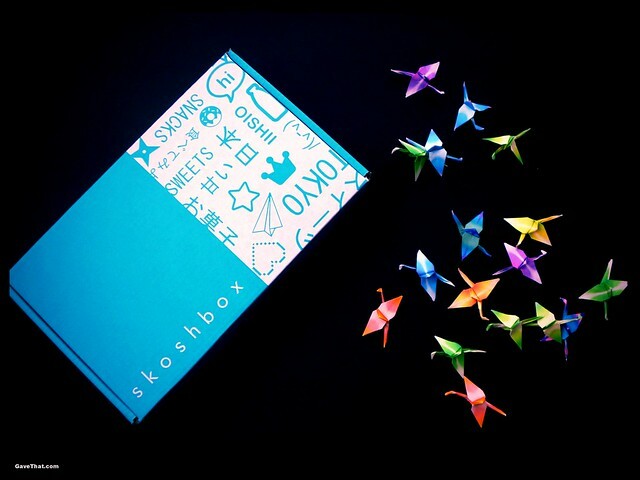 These smaller skoshboxe's start at only $10 and can be easily gifted directly to others. 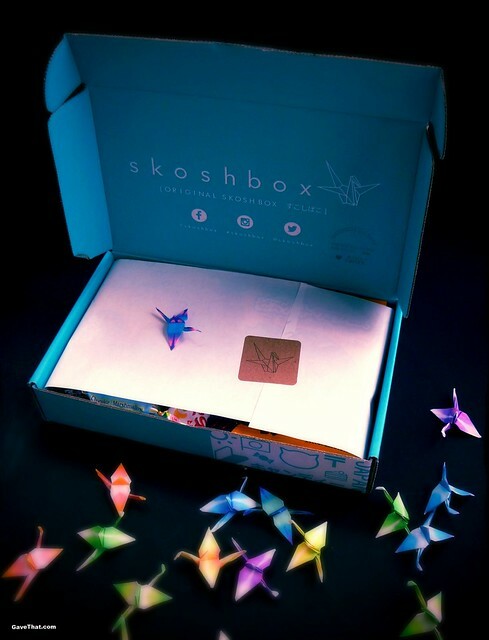 Something else to mention about the skoshbox site is they have an online shop where you can order any of the above treats plus a whole host of others individually. The takeaway from these exploration boxes (there is another larger box skoshbox also offers called the Dekabox) is everything is very fresh. 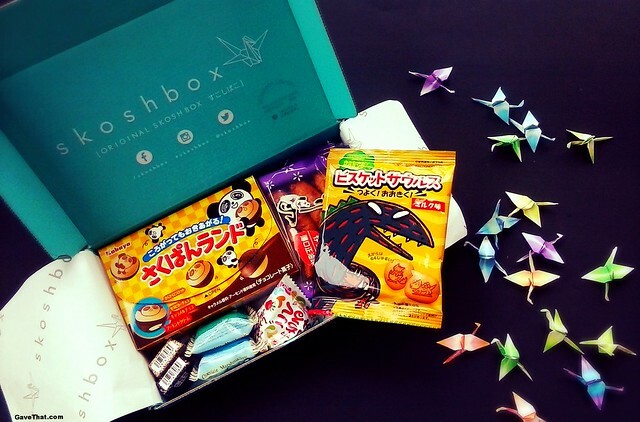 If someone asked me where to get a hold of authentic Japanese treats, skoshbox would be the automatic reply. We actually were able to taste even more treats from the shop including these WASABI ENDO MAME SNACK わさびえんどう. Magda: I really like these and could eat them all day. They're sort of a beginner Wasabi pea. Not too hot but with a light kick and nutty flavor to them. 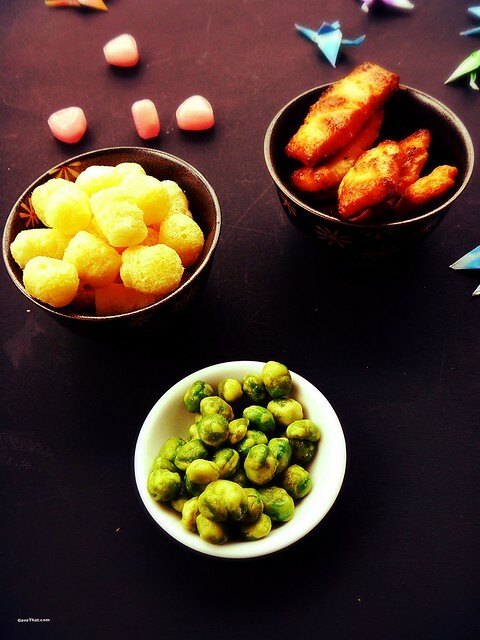 Marie: Magda put it perfectly, These are so much better than the super hot Wasabi peas. They have the delicious Wasabi flavor without the intense heat. They're also light and crispy. I'd give these 5 stars easily. Magda: For some reason I just can't get into these. They're very fresh and light and crunchy but it has this weird artificial sweetener aftertaste to them. Marie: These are somewhere between a Kellogg's Corn Pops cereal and a white cheddar cheese ball. These have that powdery feel to them but underneath is this hint of corn sugar sweetness. 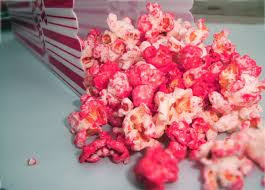 Unlike Magda I find these addictively yummy. What we both agreed on? 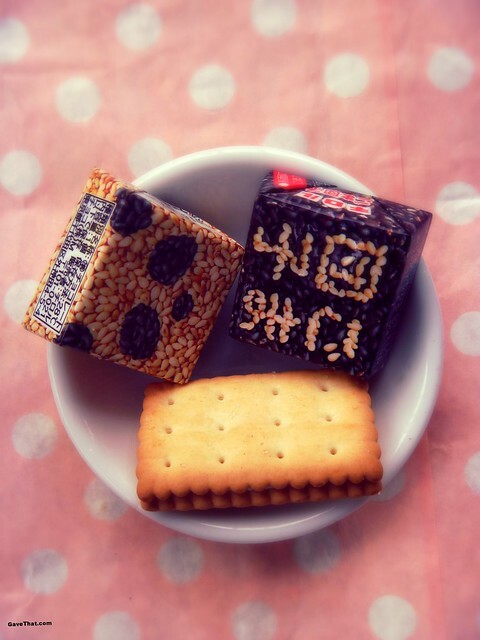 The little BISCO: PREMIUM BUTTER BISCUITS ビスコ発酵バター仕立て are beyond amazing. Think Danish butter cookies in a tea biscuit form, no bigger than your thumb, with a creamy layer of frosting inside and you have Bisco's. 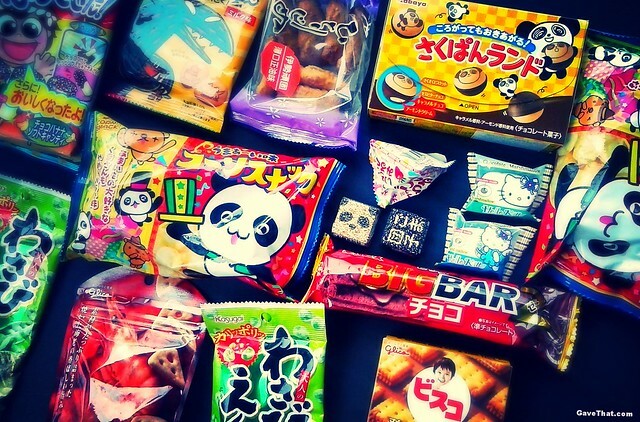 So ends part I of Two American Girls Trying Japanese Snacks thanks to skoshbox. In part II we'll be taking a peek at the November Dekabox by skoshbox along with even more candy first impressions from their online shop. To order any of the above boxes or snacks featured visit their site over here. skoshbox & Japanese treats c/o skoshbox, thank you ありがとう!